The 469 mile Blue Ridge Parkway, run by the National Park Service, connects Shenandoah National Park with the Great Smoky Mountains. Milepost numbers (MP) start at the north entrance. 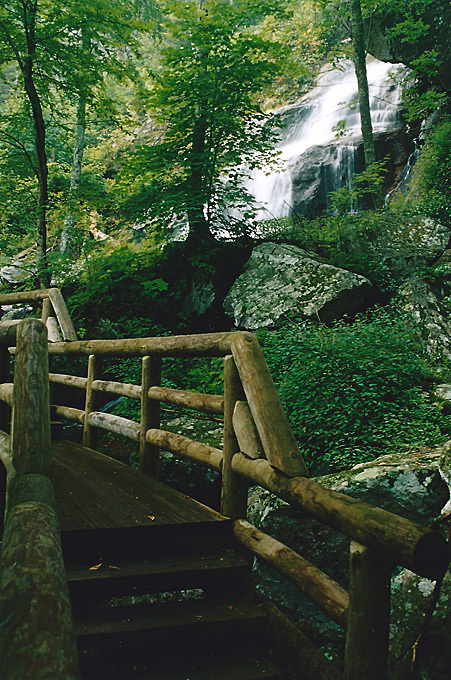 The Mountain Farm Trail is a short, easy walk next to the Humpback Rocks Visitor Center at MP 6. From this trail, you can also continue up to the excellent views from Humpback Rocks and the top of Humpback Mountain. 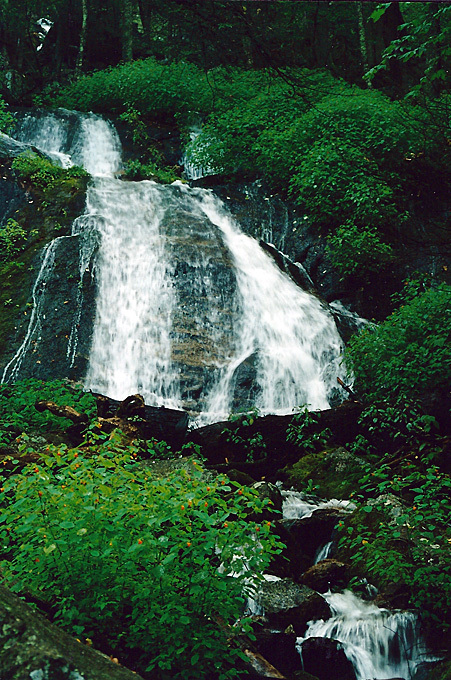 From MP 30, a 20 minute drive will take you to the bottom of the Crabtree Falls trail. 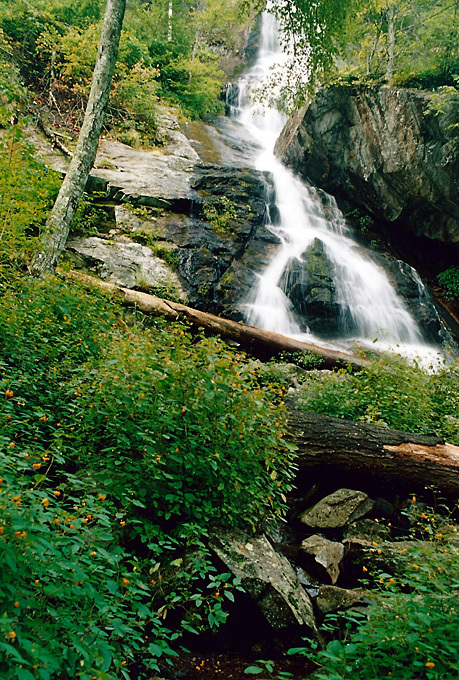 A very steep 1.7 mile climb (one way) will take you to the upper falls shown here. 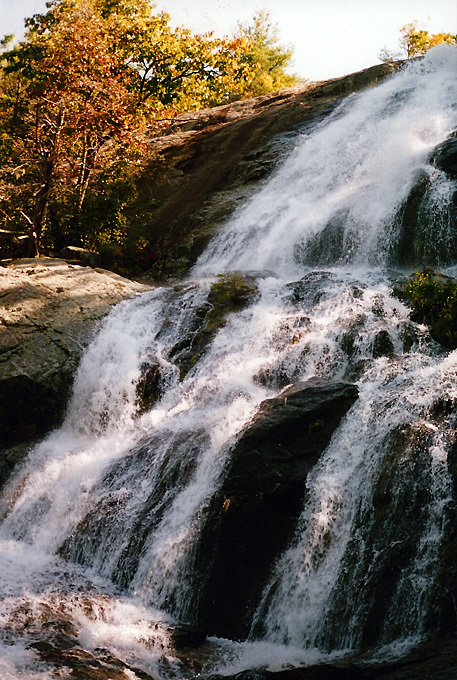 Crabtree Falls is actually a series of small falls and cascades which combine to drop almost continuously for a total of 1200 feet. You don't need to go all the way to the top to see many wonderful scenic views. Wigwam Falls is by the side of the road at MP 34. 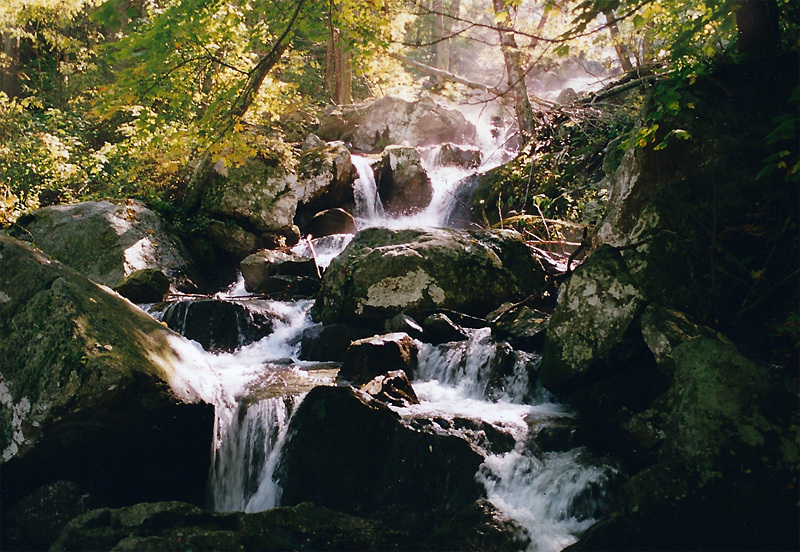 Starting at MP 79, a steep 1.2 mile trail (one way) will take you to an excellent viewing platform at the bottom of Apple Orchard Falls. Longer circuit hikes can be made here and the popular Peaks of Otter area is just a few miles to the south. 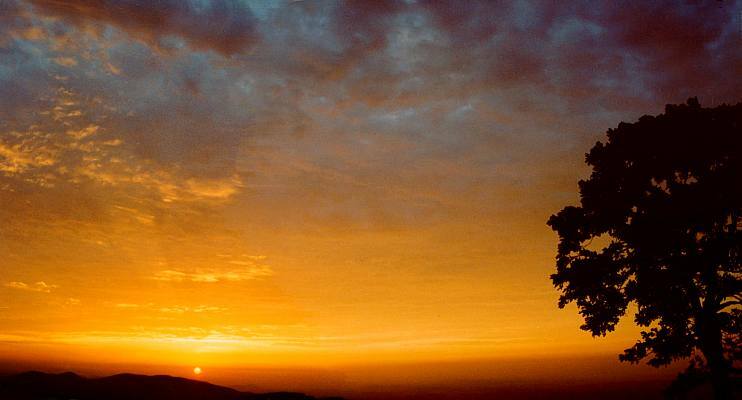 Sunrise from the Saddle Overlook at MP 168. You can drive to this overlook, or walk to it as part of the highly recommended Rock Castle Gorge dayhike. 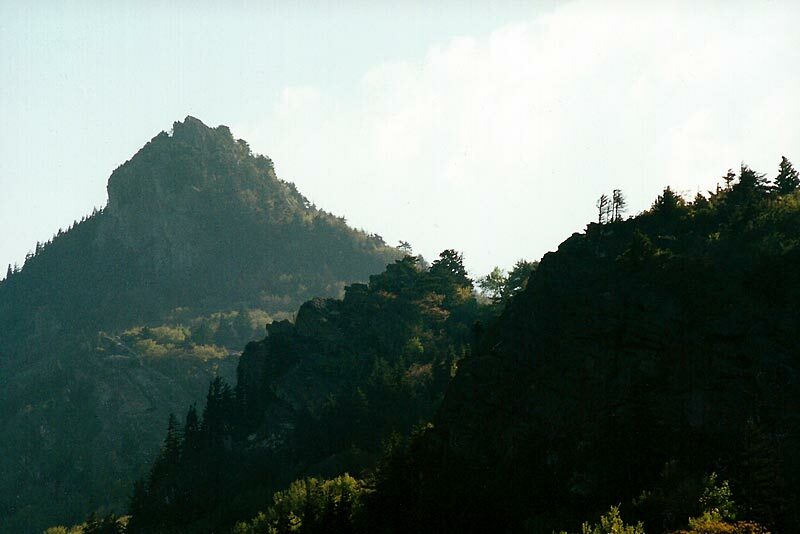 Grandfather Mountain at MP 305 is one of the most distinctive mountains on the East coast. There are many trails here as well as access to views and other activities for those who want to take it easy. 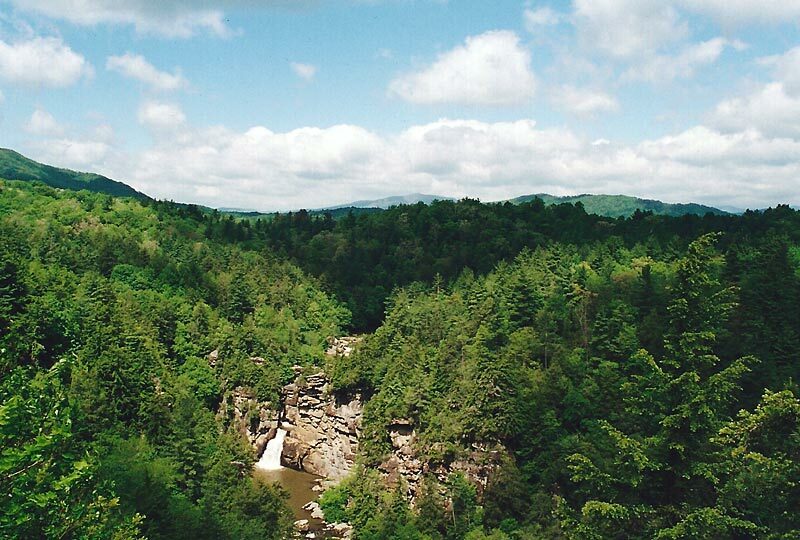 Several miles of easy trails will take you to outstanding views of Linville Falls and Gorge at MP 316. 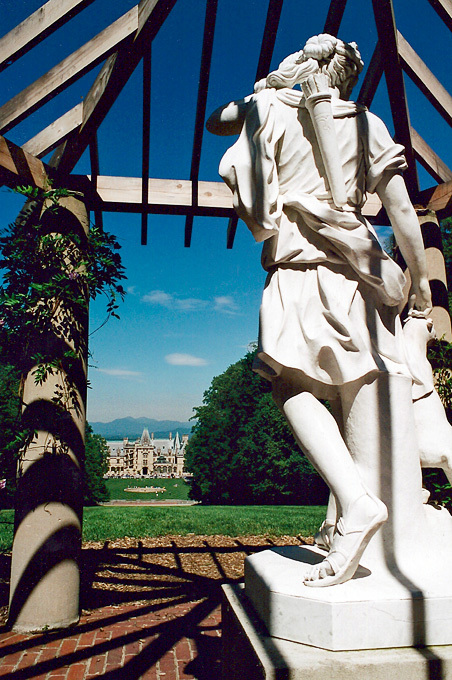 The Biltmore is the largest private residence in the United States. 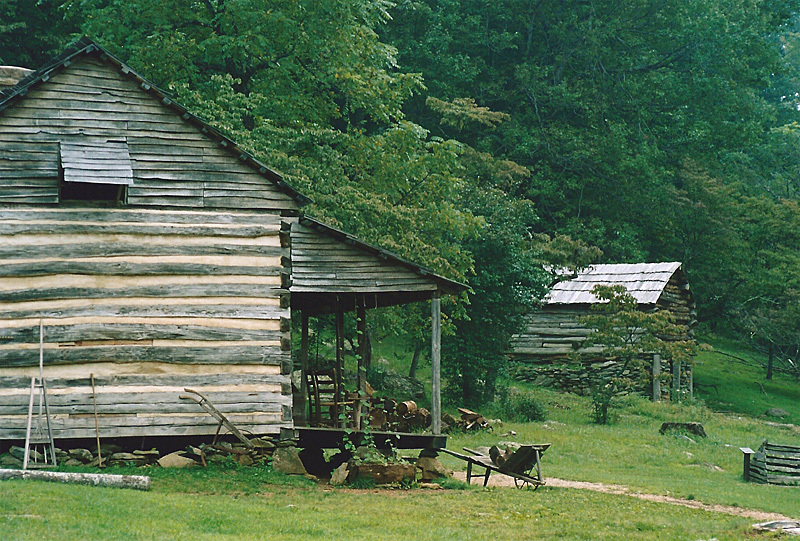 It's just a few miles off the parkway in Asheville, NC, at MP 385. Give yourself anywhere from 2 hours to a full day to explore the house and gardens.